Let me know what you think of my first self-hosted sale. Now, on with the show! 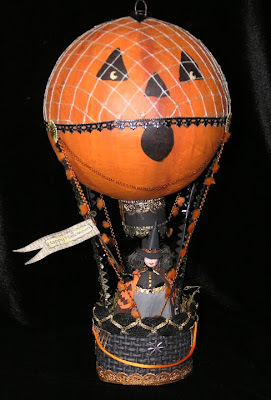 A cotton batting and paper clay faced witch stands inside the hot air balloon, which sits upright on it's own or hangs from a handmade curly hook at top. She holds a sign that reads, "Happy Halloween." 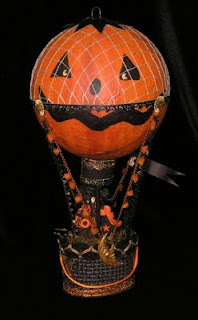 Vintage hat netting covers the top of the paper mache balloon. All hand made with vintage embellishments and Dresden trims. It measures almost 13" tall. 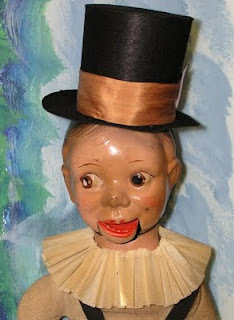 Isn't he creepy? 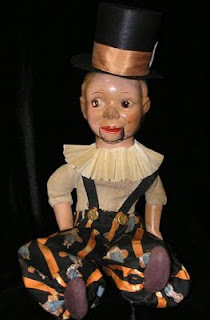 I just love the spooky look on his antique and tattered face! His head is paper pulp as are his hands and forearms. His body is intact and all original. 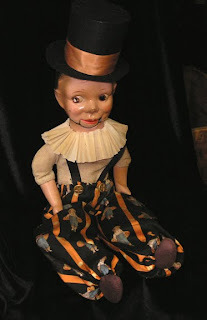 I've given him a black felted top hat with an orange silk band and black cat accent, vintage crepe collar and vintage style pantaloons with suspenders and two vintage brass buttons. I've mended his lower jaw so that it does open and close, however the pull string in back is missing. A definite one of a kind piece! 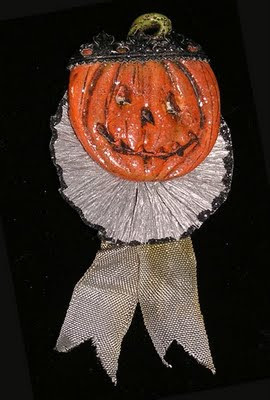 I've sculpted a smiling Jack o lantern and added clear glitter to his face and a crown of black dresden trim. He wears a collar of silver crepe fringed in black glitter and finished with vintage gray ribbon. He is made of polymer clay and measures about 3" from the top of his stem to the bottom of the ribbon. 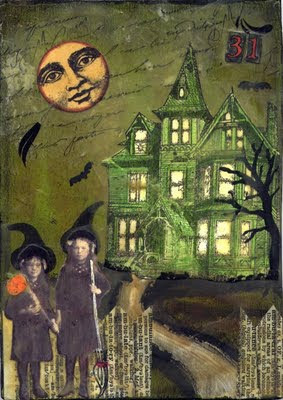 I've created a 5"x7" Halloween collage on a wood panel that celebrates haunted houses and little witches. 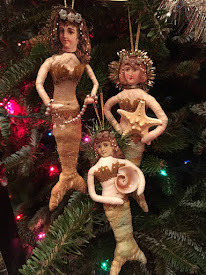 It is hand painted, stamped, embellished and then given a nice coating of 100% natural beeswax. It has the most wonderful aroma! Using a vintage chocolate mold, I've created a paper mache witch's shoe! 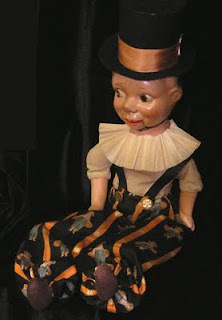 It is covered in black glass glitter, and embellished with vintage black and gold trim, vintage crepe and dresden. 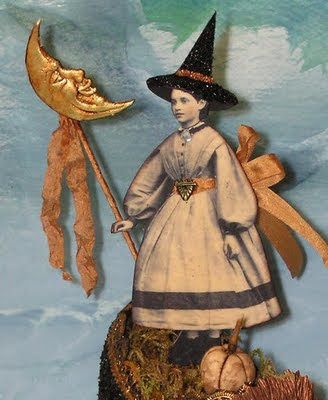 The little witch stands inside a bed of dried moss with a small white pumpkin at her feet. Her hat is covered in fine black glass glitter. 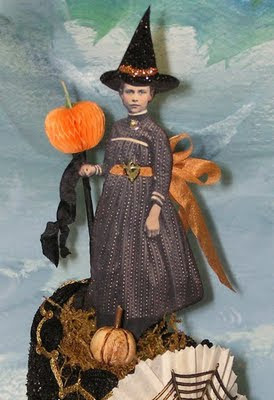 Her staff is a vintage pumpkin pick with silk ribbon streamers. It measures about 7" tall. One of a kind! 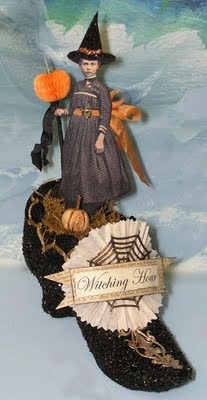 Using a vintage chocolate mold, I've created a paper mache witch's shoe! It is covered in black glass glitter, and embellished with vintage crepe and gold dresden trim. 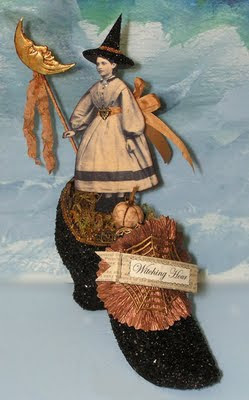 The little witch stands inside a bed of dried moss with a small white pumpkin at her feet. Her hat is covered in fine black glass glitter. 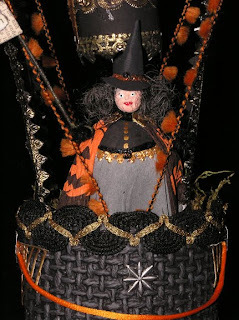 Her staff is has a dresden moon face and orange silk ribbon streamers. It measures about 7" tall. One of a kind! 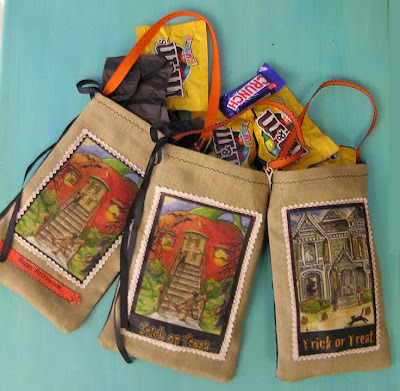 Using my original watercolor paintings, I've reproduced them and added them to linen treat bags. 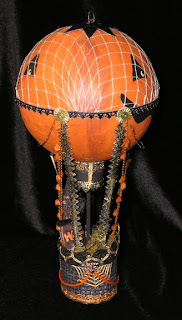 The back side is black fabric and they each have a decorative orange ribbon handle. The are about 5" x 8". Please specify if you'd like the haunted house image or the Pumpkin House image. One of a kind!